The fathers' rights movement is a response to perceived injustices in the family court system throughout the country. Advocates for both fathers and children have brought about significant changes in child custody law over the past few decades, and many divorced fathers can look forward to increased time with their children and even primary custody. Indiana, like most states, uses a "best interests of the child" standard and considers each child custody case based on the individual circumstances of the family. As a result, there aren't explicit rules for the amount of time each father gets with his child. There are, however, numerous laws and procedures that can protect the rights of fathers. Indiana law emphasizes the family unit and the importance of both parents. Thus, there is no presumption in favor of either parent and cases are taken on a case-by-case basis. This does not, however, mean there is not some bias within the system. The evaluation of custody matters is often highly subjective; one judge might favor mothers while another favors fathers, and different judges may weigh certain factors more heavily when considering the best interests of the child, even if they don't make those factors explicitly clear. Because child custody, unlike other areas of the law, does not operate according to specific guidelines -- and instead emphasizes the uniqueness of each parent -- there is substantial room for different judges to have different opinions of the same case. When the father is married to the mother at the time of conception or birth, he is presumed to be the father and his name is placed on the birth certificate. This grants him equal rights to the child, including the right to petition for custody or visitation should the parents divorce. If the parents are not married, the father may establish paternity by taking a paternity test and filing a petition to be named as the child's father. The father may also submit an affidavit of paternity and file it with the Indiana Department of Health within 72 hours of the birth of the child. This grants the father a right to be placed on the birth certificate and all other parental rights and duties. Indiana courts attempt to maintain family cohesion and almost always grant visitation to the noncustodial parent. 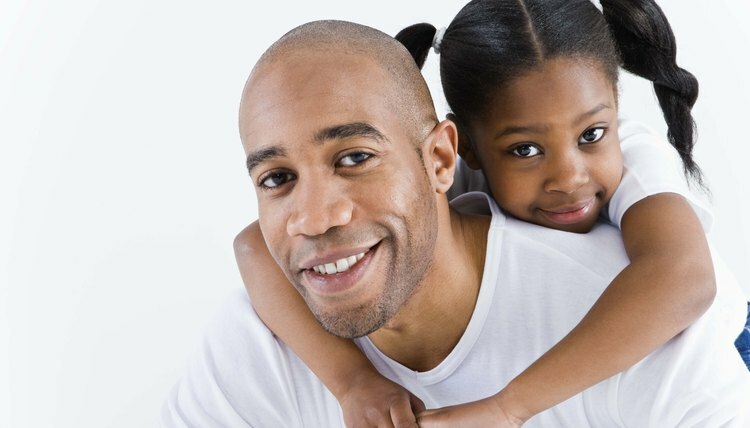 Courts determine the custodial parent based on a variety of factors, including who is the primary caretaker, more likely to encourage an ongoing relationship with the noncustodial parent, more strongly bonded with the child, who the child wants to live with and who is the more competent parent. In some cases, the courts may appoint a guardian ad litem -- an advocate for the child -- or solicit expert testimony to determine who the child should live with. There is no presumption in favor of either the mother or father, and the Indiana Family Court Rules recommend children see their noncustodial parent at least every other weekend and one weekday. Joint custody is an increasingly popular choice in Indiana. For many decades, the presumption in family courts was that very young children should not have overnight visits with the noncustodial parent -- typically the father. Surprisingly, this presumption extended well into the early 2000s. Research in developmental psychology, however, indicates this practice can interrupt the father's ability to bond with his child. Indiana now recommends that, if the father is the noncustodial parent of a child under the age of 3, he should have overnight visitation. The only exception to this rule occurs when the father has not had overnight time prior to the breakup of the relationship. When this occurs, the father and baby are encouraged to develop a bond over several months prior to the granting of overnight visits. For very young children, Indiana recommends that, whenever possible, children have daily contact with their parents. The courts emphasize visit frequency over visit duration for these young children. Child support is typically paid by the noncustodial parent to the custodial parent to help cover childcare and other child-related expenses. It is based on a combination of the child's needs and each parent's income. When parents share custody, the parent who pays child support will typically be the one who makes more money. Parents who lose their jobs or experience another loss in income can petition the courts to reduce their child support obligations. Failure to pay child support in Indiana can result in fines and jail time. In most states, two kinds of custody apply to all separating families: legal and physical. Legal custody refers only to major decision-making, and physical custody refers to the parent with whom a child lives. A parent with sole physical custody is sometimes referred to as the residential or custodial parent; this is the parent with residential custody. When a child lives a relatively equal amount of time in each parent’s home, this is referred to as shared custody, also often called joint custody. Oklahoma, like all states, uses the "best interests of the child" standard in making custody and visitation determinations. However, this standard can be quite vague and lead to different results in similar cases depending on the judge, lawyers and other factors not related to a child's best interests. Consequently, Oklahoma has developed a set of visitation recommendations according to age and parental circumstances designed to help judges make uniform decisions that benefit children. Oklahoma also has standard rules for child support that make it easier for parents to calculate the child support they will likely pay.